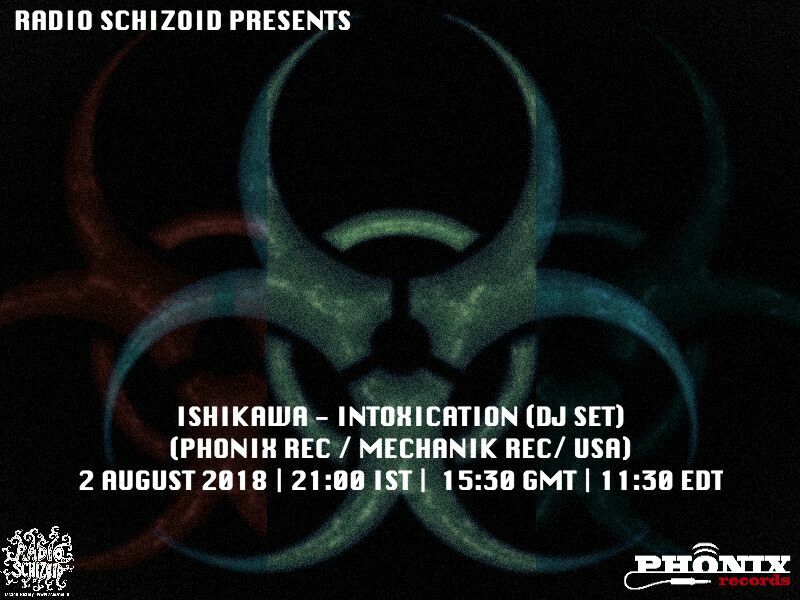 Ishikawa ( Angad Kumar Kapoor / Phonix Records / Mechanik Records ) – presents “ Intoxication ” on Radio Schizoid on 2 August. Ishikawa is Angad Kapoor from Mumbai, India. At the age of 14, he first came into contact with psychedelia listening to Infected Mushroom’s Psycho. Although he is most interested in music for the twilight hours featuring music from the likes of Lost N Found, Digital Talk, and Earworm – his sets range from euphoric morning sounds featuring music by Burn In Noise, Protoculture, and Terrafractyl amongst others; to bone crunching dark music from the minds of artists such as Claw, Para Halu, Entropy & Rev. Presently based in Atlanta USA where he has graduated from university – his mixes have been regularly featured on a number of radio streams now, Radio Schizoid (India), Pump Up The Volume (France), Boomadelic (Israel), The Cheeky Grin (Australia) and Babaganousha (Germany). Having been active in the scene for over 8 years, in 2010 he decided to join Phonix Records with the intent of promoting upcoming artists and above all – pushing nothing but good music. Since then he has gone to play at a number of parties as well as the third Sacred Seed festival in Georgia, USA. In 2011, he joined the legendary Mechanik Records family to continue forward with his mission of promoting nothing but the very best in psychedelic trance music.